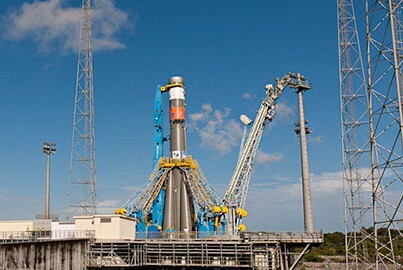 Soyuz subsequently was moved on a transporter/erector rail car to the ZLS launch zone using the familiar horizontal transfer process – followed by its erection to the vertical orientation and positioning over the launch pad, suspended in place by four large support arms. 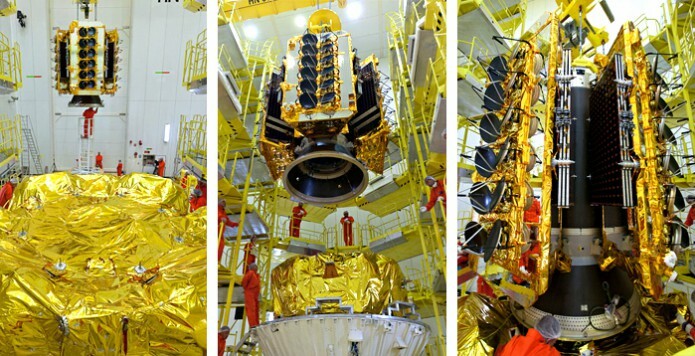 With this step completed, all was ready for the purpose-built 53-meter-tall mobile gantry to be moved into position around the launcher, providing a protected environment for installation of the “upper composite” – which consists of the four O3b Networks spacecraft, the Fregat upper stage and the ST-type payload fairing. These O3b Networks Ka-band relay platforms – which were produced by Thales Alenia Space – will create a satellite constellation for telecommunications and Internet services that combine high speed and affordable costs for billions of people across the world who do not yet have adequate internet access. This week’s launch will mark Arianespace’s eighth Soyuz mission from the Spaceport since this workhorse vehicle’s French Guiana service entry in October 2011, as well as the company’s second mission at the service of O3b Networks – following the orbiting of its initial four satellites with Soyuz in June 2013.